While hardwood floors and smooth tile may look great in your home, they're not particularly easy for dogs to walk on. Your pup's foot pads don't have that same grip that our feet do. As a result, your dog needs to rely on their claws to get better traction on the ground below. When they're outside, that isn't a problem. However, claws and beautiful slick surfaces do not mix indoors. you can provide your dog with a bit more stability while protecting your floors with a pair of non-slip dog socks or booties. Socks and booties simply slip over your dog's feet. 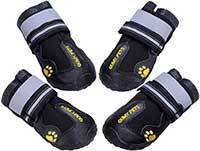 They feature a rubberized bottom to give your dog a bit more traction. They come in a number of different designs, allowing you to choose a product that's right for your dog. Here are some of the best socks and booties on the market. These adorable little socks from Expawlorer are designed for indoor use. They're made of soft, woven cotton, ensuring that your dog stays comfortable while they wear them. The fabric stretches, allowing it to conform to your pup's paw. On the bottom, a pawprint design is printed onto the sock with anti-slip silicone. It provides better traction on the ground to prevent slipping. These socks come in a pack of four. They're available in four different sizes and a handful of colors as well. 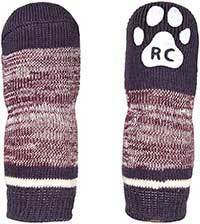 Give your dog some style with these RC Pet Products Pawks Socks. They come in a wide range of fun colors and patterns. You can even find a style to match your pup's personality. They're made from soft cotton and feature an anti-slip bottom. In addition to providing better grip, the socks are thick enough to cushion the joints and provide additional comfort. There are five different sizes available. The manufacturers also provide a sizing chart to help you find a size that's right for your dog. If you're looking for socks that your dog can wear anywhere, consider this option by Dog Quality. It features a simple cotton sleeve that slips over your dog's paw. However, the entire paw portion is covered in rubber to provide the best traction possible. Because the rubber rises over the paw, it's also water resistant. Your pup can wear the socks outdoors without having to worry about covering their feet in mud. They can even be worn in the snow during those cold winter mornings. Looking for affordable socks that can be tossed in the washing machine? These traction control socks from LFPET are a great option. They come in a pack of five pairs, providing your pup with a collection of socks to use. They're made of cotton and feature an anti-slip pattern on the bottom for better grip on slippery floors. The socks also come with four velcro straps. The straps can be used to provide a more snug fit that prevents the socks from slipping off. With their rugged design and secure fit, these dog boots from Qumy are ready for any adventure. They're made of thick materials that are sewn together much like a standard human shoe. The bottom features a rubber sole. It has thick treads for better traction in virtually any environment. Overall, the booties are capable of keeping your dog mess-free. They can also keep them safe from hot pavement or cold snow. Two adjustable straps ensure that you can get a tight and comfortable fit on your dog. Another excellent option from Expawlorer, these dog boots are designed to provide multiple layers of protection. The bottoms feature a flexible rubber sole that has traction-control lugs to keep your pup stable. The rubber also provides an effective barrier against extreme temperatures. On the tip of the booties, the rubber is a bit thicker to keep your dog's toes protected. The uppers are covered in waterproof material and feature reflective threads for better visibility. Two adjustable straps make quick work out of putting the booties on. The anti-slip dog boots from My Busy Dog are made with high-quality materials and strong construction methods, making them very similar to human boots. The booties have thick rubber soles with anti-slip treads. The thick rubber can protect your dog from sharp objects and extreme temperatures. Water-resistant materials are used on the uppers. To help the boots stay on during your adventures, there are two velcro straps on the top. They can be tightened in seconds. The straps are covered in reflective material as well. 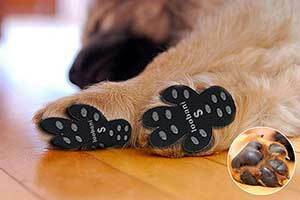 The Loobani Protector paw pads a unique alternative to socks or booties. Instead of covering the entire foot, they're attached to the bottom of your dog's paws with an adhesive. The adhesive is hypoallergenic and environmentally friendly. It's very similar to what is used on standard bandages. You can cut the pads to cover each individual paw pad or apply the product in one piece. The pads are made out of thick, breathable fabric. Large rubber dots are applied to provide traction. 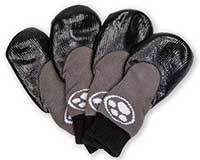 These paw pads come in a pack of 48 and are available in six different sizes. Socks and booties can look a bit silly at first, but they're a very practical accessory to have on hand. They can provide your pooch with a number of benefits and change the way they walk around your home. One of the biggest advantages of non-slip socks or booties is that they give your dog more traction around slippery surfaces. Dogs can quickly develop a fear of hardwood or tile floors if they continue to slip on them. This is especially true if injuries occur due to the fall. Non-slip accessories eliminate the problem altogether. They're designed with rubber or silicone pads. The somewhat sticky material grips onto the smooth floor, providing more stability for your pooch as they walk. They can help dogs of any size, weight, or breed. If your canine companion has particularly furry feet, you may notice a drastic difference in their stability when they're wearing non-slip socks. Older dogs are at a higher risk of getting injured on slippery surfaces. They could easily lose their balance, causing them to hit the floor hard. 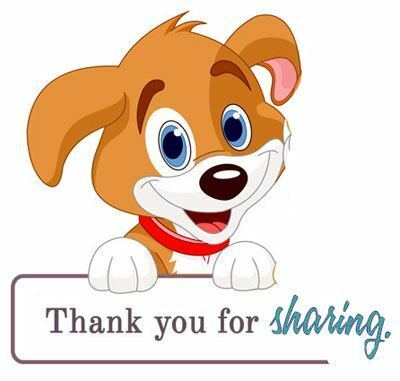 If your dog already suffers from a health condition, they may be suffering in silence. Dogs with hip dysplasia or arthritis feel pain every single time they get up and walk around. Slipping only makes the pain worse. A great set of socks or booties can help out tremendously. Not only do they help to prevent falls, but they can actually help your dog get around a bit easier. Some owners use socks on only the front or rear legs so that their older dog can scoot around and stand up without any problems. Let's face it, your floors are a big investment that you need to protect. No matter how much you love your canine companion, it's never easy to watch expensive floors getting ruined by sharp claws. Socks and booties can create an effective barrier that keeps your floors looking great. Scratching can also affect dogs. While you should always keep your pup's nails trimmed and filed, even groomed nails are at risk for snagging. Dogs can snag their nails on hardwood floors. It's a pretty painful injury that sometimes required surgery to fix. Needless to say, it's better to just avoid the problem altogether with some great canine footwear. We humans wear shoes to protect our feet from injury, so why not provide that same benefit to dogs? Dog booties are quite effective in protecting your dog's feet from a variety of potential hazards. Not only do they provide good traction, but the thick materials also prevent small thorns or rocks from hurting your pup's precious paws. Many booties can even act as an insulator to protect your dog from extreme temperatures. During the winter months, booties are a must-have accessory that can prevent frostbite. In the summer, they can be used to avoid burns from the hot pavement. Even in moderate temperatures, some booties and socks offer protection from messes. There are many waterproof products on the market. They ensure that moisture and mud don't make its way inside your home through your dog's feet. Whether you decide to go with socks, booties, or paw pads, these accessories can help your dog navigate your home with more confidence. Hardwood floors, tiles, and other slippery surfaces can be scary to walk over for any dog. With the added support and traction from non-slip footwear, your dog can walk on any surface without issues.